In part one of our multi-part series, we talked about a few of the many different types of ceiling fans available for you to choose from. From sleek low-profile ceiling fans to decorative dual-motor ceiling fans, there really are an endless amount of choices when it comes time to pick the perfect ceiling fan for your home. 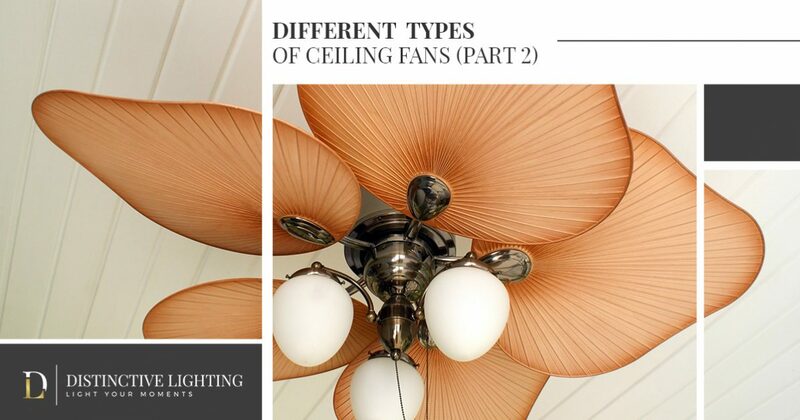 In part two of our multi-part series, we will take a closer look at three different types of ceiling fans that you can expect to find at our sprawling lighting showroom. If you are searching for the highest-rated lighting showroom in Bozeman and the Gallatin Valley, stop by Distinctive lighting today! We have more than 30 years of knowledge and experience in helping individuals throughout Montana find the perfect lighting solution for their needs, and we’re ready to help you, too! From pendant and task lighting to warm and inviting ambient lighting, we truly offer the widest selection of light fixtures and lighting products in Montana. If you would like to learn more about some of the many different ceiling fans available for purchase, continue reading more in today’s article! Wet fans are incredibly unique for a number of reasons when compared to other ceiling fans. In fact, if you live in a climate that is generally much more moist than the rest of the country, then you know how important it is to have a ceiling fan that is capable of resisting humidity. For this reason, wet fans are an exceptional choice for placing outdoors such as under your patio or covered area. Best of all, many wet fans can be washed with a hose, making frequent cleanings quick and painless. If your home features tall ceilings, you may find it difficult to incorporate a remote controlled ceiling fan in your living area. However, there is no need to worry, as remote controlled ceiling fans are fit for the job! These types of fans are perfect for vaulted or cathedral-style ceilings, and make pushing air throughout your home easier than ever. You may not be ready to invest in a high-quality ceiling fan just yet, however, there are a number of ceiling fan alternatives that can be mounted on your wall or taken from room to room. These portable fans are relatively affordable, and often feature intricate designs and decorations. So whether you are looking for a smaller fan to place on a desk or you are looking for a stand-up fan that can be placed in the corner of your room, portable fans are perfect for your needs. We hope that you enjoyed reading our multi-part series on ceiling fans. If you are interested in learning more about our full selection of lighting products and light fixtures, head on over to Distinctive Lighting’s showroom in Bozeman today! We have the largest offering of lighting products, and we work with all of our customers to help them find the perfect light fixtures for their needs. Contact us today to get started!